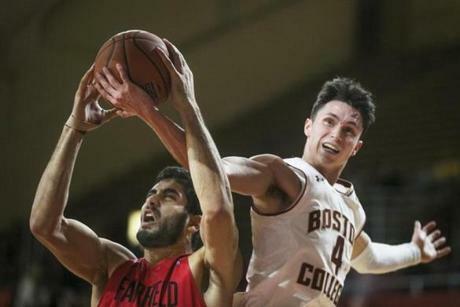 Chris Herren Jr. (right) and Vin Baker Jr. (second from right) in action for BC against Fairfield. Both players have fathers whose lives were ravaged by addiction before they recovered to help others. Danny Ainge smiles when asked about Chris Herren Jr. and Vin Baker Jr., 19-year-old teammates at Boston College. They are both sons of former Celtics whose talents were robbed by substance abuse. Both endured the pain of growing up in the shadow of an addiction that rips families apart. But both, too, are wise beyond their years, and their futures are bright. The sons have a special bond that few can understand. Addiction nearly killed Chris Herren and Vin Baker, who somehow emerged stronger from their struggles. 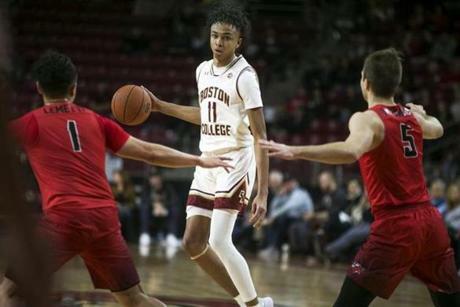 “I could put myself in his shoes and he could put himself in my shoes,’’ says Vin Baker Jr., a 6-foot-7-inch sophomore forward. “I’m always asking him, ‘Are you good?’ And I just know it’s tough being around here, especially since his dad went here. Chris Herren played only one game of the 1994-95 season at BC, scoring 14 points in 21 minutes before breaking his wrist and ending his season. He was expelled after failing three drug tests and transferred to Fresno State. The sons agreed to talk about their lives and their fathers’ transgressions in the hope that it might help others. It is not easy. They haven’t even discussed it with their teammates. But now the players with familiar names on the backs of their uniforms are starting to come into their own. Vin Baker Jr. is averaging 2.3 points in 8.3 minutes per game. On Dec. 16, Herren Jr. was inserted into the starting lineup against Fairfield because of an injury to another player and poured in 22 points. Coach Jim Christian then surprised the 6-3 walk-on freshman guard with a full scholarship just before Christmas. Herren Jr. said he felt “confident and comfortable” playing on the court where his father and uncle briefly played. 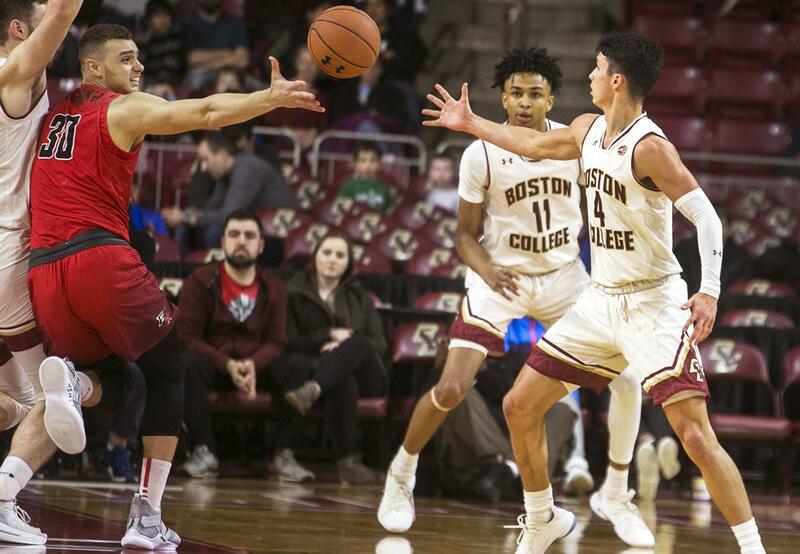 Chris Herren Jr., who was a walk-on player, has a brand new scholarship at BC. 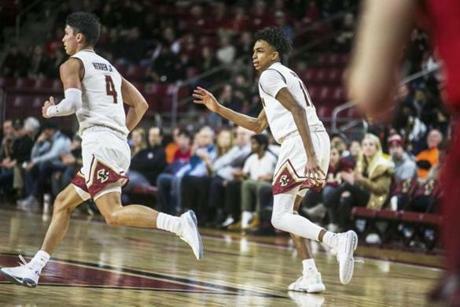 Earlier this season, Herren and Baker hit 3-pointers to seal a victory against Wyoming in the semifinals of the Fort Myers Tipoff. Baker Jr. has the highest vertical leap on the team (he can touch 2 feet above the rim) and is averaging 2.3 points in 8.3 minutes per game. Vin Baker 47, a four-time NBA All-Star and Olympic gold medal winner, by his own account lost more than $100 million in a career destroyed by alcohol and pills. He has been sober since April 17, 2011. He has become an ordained minister and worked with children in Harlem’s Abyssinian Baptist Church. He became a Starbucks manager, a Fox broadcaster, and now is basketball operations associate and director of program development for the Milwaukee Bucks. He recently started the Vin Baker “Bouncing Back” Foundation to improve the lives of those affected by alcohol and drug addiction. 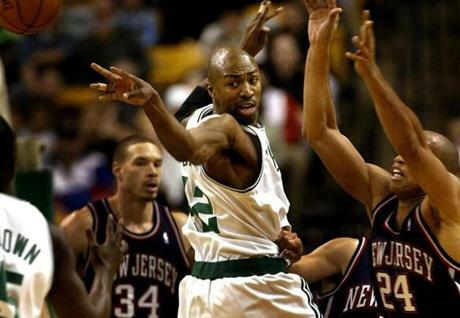 Vin Baker during his Celtics days in 2003. He coached his son in AAU ball and stepped up as a father. When he travels, he FaceTimes his son almost every day. “Every conversation we have, I always end it with, ‘You’ve already made dad SO proud,’ ” he says. 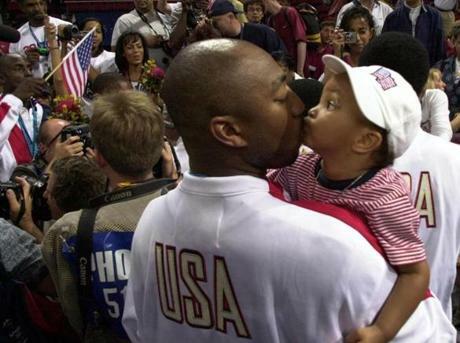 Vin Baker with his son, Vin Baker Jr., after a game with the US Olympic team in 2000. That’s from a guy who played in the 1996 All-Star Game with Michael Jordan, Shaquille O’Neal, Reggie Miller, and Patrick Ewing. Baker Jr., a long and lanky forward, is going through a growth spurt, both physically and mentally. He’s growing into his body and wants to add more muscle to bang with the big boys. “I feel like there’s nothing you can’t overcome,” he says. He even delivered a sermonette at the Full Gospel Tabernacle Church in Old Saybrook, where his grandfather is the pastor. Vin Baker Jr. takes a shot vs. Fairfield. But early on, Baker Jr. had a target on his back. As he got older, the taunts got nastier. Other children, parents, and even some coaches were cruel to him. 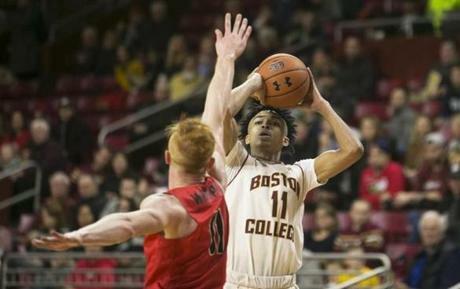 He had to go to three high schools before eventually winding up at Hamden Hall Country Day School, where he averaged 16.5 points, 7 rebounds, and 2 assists his senior year. “My whole life, like everybody seems to focus on the negative things the most,” he says. Chris Herren, 43, was an All-America player at Durfee High School in Fall River. He did his first line of cocaine at BC in 1994 and didn’t stop for 14 years. He played two seasons in the NBA (Denver, Boston), eventually spending $20,000 a month on Oxycontin, heroin, and various other narcotics. His addiction continued through pro basketball stints in Italy, Turkey, China, Germany, Iran, and Poland between 2001-06. Now he is a motivational speaker who has bared his soul to an estimated million people. He has been sober for more than a decade. In 2011, he formed The Herren Project, which provides help for addicts and their families. He recently opened two wellness centers in Seekonk. 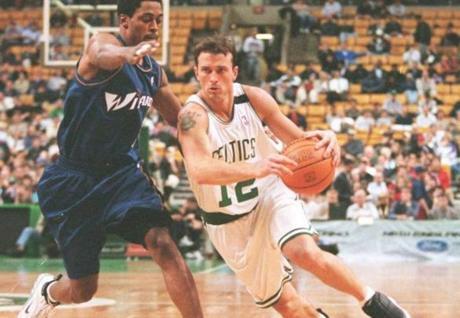 Chris Herren as a Celtic. Like his teammate, Herren Jr. had similar problems when he first took the court. “It was bad,” he says. “Playing in gyms as a 15-year-old kid, you know, 120 pounds and I’m walking into places hearing all types of [stuff]. Eventually he fought back. He didn’t like kids screaming “junkie” and worse things to him. Herren Jr. says he used the verbal abuse as motivation to be a better player. “I always play with a chip on my shoulder,” he says. He credits his mother (“an angel”) for shielding him from his father’s addiction. In 2008, Herren was found slumped over the wheel of a car in Fall River with a heroin needle in his arm. Paramedics said he was clinically dead for 30 seconds. Young Chris didn’t find out about that until much later. “I only remember my mom just being upset, but she kept everything normal for us at the same time,” he says. 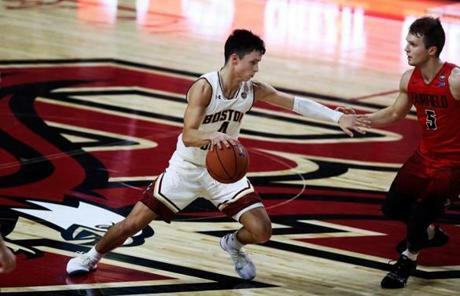 Chris Herren Jr. says he plays with a chip on his shoulder. Herren Jr. wasn’t widely recruited by Division 1 colleges. In his last season at Tabor Academy, he played in pain for seven games until an MRI revealed a stress fracture in his lower back, ending his season. He was in a full torso hard-shelled cast for three months and missed the showcase AAU circuit, where Division 1 coaches recruit high school players. But BC assistant coach Scott Spinelli believed in him. Herren says the decision to attend BC was totally up to his son, but he toured the campus with him. “He jumped in the car and said, ‘Dad, this is where I want to go,’ ” says Herren. Herren Jr. also wants to help others. “I am the proudest parent that can be, for so many reasons, on so many levels,” says Herren. “To watch my son blaze his own trail and not be in fear of the past and face the opportunities in front of him is amazing.